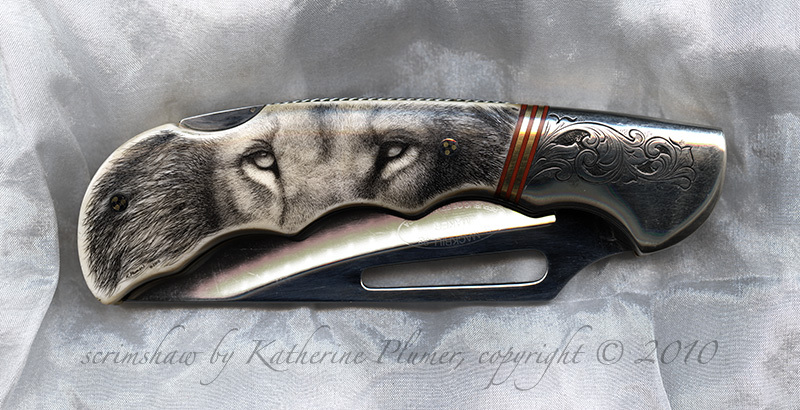 My life, under the microscope...: The Lion Knives! I have to say a word about these photos... and apologize for the fact that they don't show the engraving on the bolsters well at all. I have major stuggles when it comes to photographing that darn shiny metal stuff. I can arrange and light things to show the ivory well, or the metal well, but I can't for the life of me figure out yet how to photograph the WHOLE THING well. (That's why there are professionals who do this, right?) So, apologies to the engraving, but I'm giving the scrimshaw priority when it comes to the picture! Actually, they're not really photos, they're scans. My photos were pretty bad. I don't know who did the engraving. The black and white knife is 4-3/8 inches long (the whole knife, not just the scrimmed area), and the color one is 5 inches in length. This was a custom commissioned project, so they are both sold. I am pretty much thrilled with how they turned out. When I get a chance to update the website, I'll put some closer-up images on there. Did you have to remove the scales on the B&W to work around the fasteners? Looks like that could be a very tedious part of the work. Both are gorgeous! I'm sure the owner(s) are pleased. This knife is amazing! My husband is going on an African safari soon, and I would love to get him one of these for his trip. I love all the detail. I can tell that the ends are also engraved, I wish I could see it up close, and see all the detail.